Eating well is important for everyone at all ages. Whatever your age, your daily food choices can make an important difference in your health and in how you look and feel. By leading a healthy lifestyle, staying active and eating a nutrient dense diet, you can help slow down the aging process and may even prevent age-related diseases such as osteoporosis, diabetes, (insert comma) and heart disease. Yogurt is one of the oldest health foods. In the 1970s, reports claimed that the secret of the Egyptians well known long lives was yogurt and the Egyptians at the time called yogurt and honey the foods of the Gods. Even Cleopatra from ancient Egypt was famous for her daily sour milk baths that kept her skin glowing and youthful! Being a super food, yogurt contains many powerful nutrients. It is rich in calcium, which helps prevent osteoporosis, loaded with zinc which has anti-inflammatory properties that aids in swelling and rashes, and contains probiotics that help maintain gut health. Fish is a rich source of omega-3 fats, which helps prevent cholesterol build-up in arteries, lowers triglycerides and protects against abnormal heart rhythms. Omega-3 fats also play a role in lowering blood pressure and improving cognitive function. The American Heart Association recommends we consume at least two serving (3.5 oz cooked each) a week. Many studies have shown that nut consumption has potential beneficial effects for heart disease, diabetes, Alzheimer’s disease, and cancer. Nuts are rich sources healthy fats, vitamins, proteins and antioxidants. One serving of this super food provides more antioxidant activity than most fruits and vegetables! 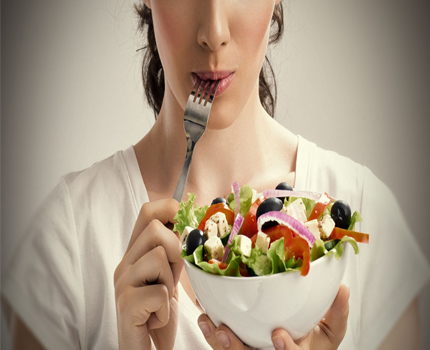 Antioxidants fight the free radicals that cause wrinkles and play a role in preventing cancer. In fact, darker colored berries tend to provide optimal anti-aging benefits as they have the highest amounts of antioxidants. Tomatoes contain lycopene, an antioxidant compound that helps maintain youthful skin and may reduce the risk of some types of cancer as well as heart disease. Dark leafy greens like kale and spinach contain plant pigments that protect your eyes from the harmful effects of the sun as well as keep your vision sharp. Leafy greens are also rich in Vitamin K, a nutrient that plays a role in reducing bone loss and preventing fractures. The monounsaturated fats found in olive oil play a role in lowering bad cholesterol and thus decrease the risk of heart disease. Additionally, olive oil works as an excellent skin moisturizer due to its high content of antioxidants and vitamin E as they both work naturally to protect us from free radicals, which are known to accelerate the aging process. Dark chocolate will curb your sweet tooth and help you age gracefully as well! Studies show that cocoa flavonols help preserve the healthy function of blood vessels which lowers the risk of high blood pressure, type 2 diabetes, kidney disease and dementia. Finally, though there is no magic cure for turning back the clock, eating nutrient-dense, healthy foods from all of the five different food groups (grains, protein dairy, vegetables and fruits), cutting down on processed foods, fried items and sugar filled beverages, leading an active lifestyle and wearing sunscreen will keep you looking and feeling younger and wonderful!